Any chance you might have a Whovian on your list this year? FAN-TAS-TIC! 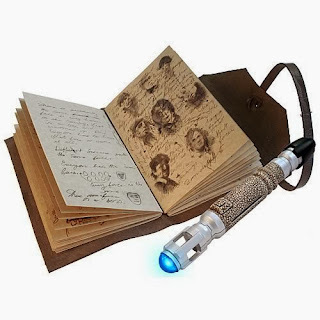 What I love about these journals is that some of the pages are filled in with details from the show, and there are still some blank ones that your own Time Lord can use to record their comings and goings. And the mini screwdriver with the light-up end is actually a pen, so they can fix the Tardis and then write about it. Now, a word of caution: Be careful as you shop for these: some are discontinued, some are currently sold out and others are insanely marked up because the Doctor, he's so hot right now. 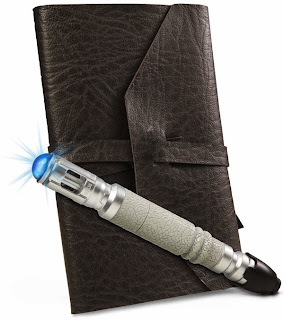 If you don't think your discriminating Whovian would appreciate a pen screwdriver and would prefer an actual replica, then your best bet is to check out Amazon and ThinkGeek for those.